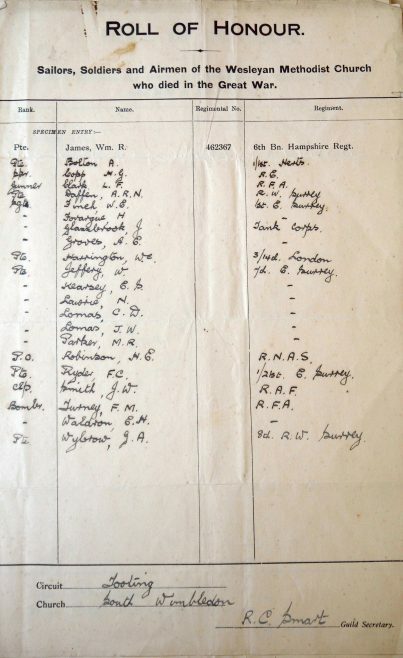 The description of the memorial on the IWM site, however, lists twenty-two men. This list is of twenty-one of them. In the following transcription the names on the plaque are highlighted. No corroborating evidence relating to A. Bolton or J.W. Lomas could be found. Pte. A. Bolton 1/1st Bn. Hertfordshire Regt. Pte. W. Harrington 3/14th Bn. London Regt. Pte. W. Jeffery 7th Bn. East Surrey Regt. Pte. F.C. Ryder 1/21st Bn. East Surrey Regt. Pte. G.A. Wybrow 8th Bn. Queen’s (Royal West Surrey) Regt. Listed on the plaque and description, but not on this document.